A group of activists, who are openly refusing to pay their taxes to the IRS, are instead donating the money to humanitarian programs. As the United States military and its allies continue to escalate conflicts in Syria and throughout the Middle East, an anti-war group is carrying out nationwide protests on Tax Day to oppose war funding. 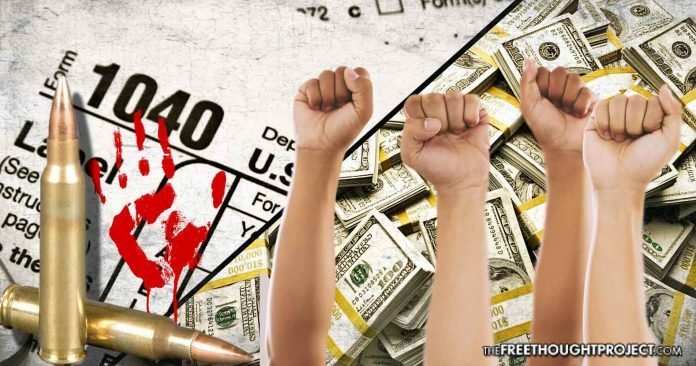 The National War Tax Resistance Coordinating Committee (NWTRCC), made a statement last week calling for an end to war and proposing a massive movement of tax resistance. The organization has coordinated Tax Day protests since 1983 and their message is more important now than it has ever been. “The National War Tax Resistance Coordinating Committee supports individuals who refuse to pay for war, and promotes war tax resistance in the context of a broad range of nonviolent strategies for social change. Through the redirection of our tax dollars, war tax resisters contribute directly to the struggle for peace and justice for all. Some activists, who are openly refusing to pay their taxes to the IRS are instead donating the money to humanitarian programs. “Tax resistance is a way to address all of the overwhelming issues facing the earth and its people at this time where literally everything of importance and of value to our communities is under attack,” said Noura Khouri, an activist who marched in Oakland, California. The time has come to start thinking unconventionally when considering alternatives to the current methods of funding community projects. As it stands right now our civilization is forced to fund projects involuntarily through coercive taxation. The force and violence involved with the collection of taxes are only scratching the surface of the negative consequences that this practice has on our society. Let’s take a moment to hash out the implications of coercive taxation. Since the government is allowed to extract money from the people by force, this guarantees they will have funds for any project they want, even if those projects are unpopular with taxpayers. This is because the public has no choice but to pay taxes, therefore they have no say in how their money is used. Thus the tax-paying public end up paying for their own oppression and unjust wars around the world. Sure, there are some social welfare programs that assist people, but the cost of these projects is a tiny fraction of the money that is actually received via taxation. Most of the money that is stolen through taxation is used for bureaucratic budgets, collection enforcement, and the gluttony of federal and state governments. So while a portion of the revenue is being used for beneficial projects, a majority of the money is still being wasted or used for nefarious purposes. Imagine a thief giving you five dollars while also taking a hundred dollars from your back pocket. One of the most common complaints about the government is that it does not truly serve the public. The reason for this is simple—the government gets paid regardless of whether or not the people are satisfied. This means they have no incentive to actually listen to the public they depend on for funding. Likewise, the disharmony between the state and citizen inevitably leads to mismanagement, violence, and corruption. On the other hand, if community projects were funded through voluntary means people would only pay for the services they wanted. This would likely lead to a lack of funding and the eventual collapse of authoritarian governments as they were faced with either extracting funding from the public using physical force or adjusting their own behavior. Under these circumstances wars would be prevented, small businesses would have an easier time competing in the marketplace, and trillions of dollars in wasted overhead would either be back with its rightful owners or used in beneficial social projects and programs. If someone wanted to invade territories halfway around the world or put together an oppressive bureaucracy like the Department of Homeland Security, they would lose funding because most people would not willingly support their authoritarian adventures. This is the whole concept behind voluntarily funding community projects: good service will render payment from the public, while poor service will lead to a lack of a customer base and thus a lack of funding. It is time to recognize that forced taxation is not working for the average person and ideas like “the consent of the governed” and “the social contract” are complete fallacies. We must acknowledge that there is a growing discontent among Americans. The two corporate political parties are losing support and people are losing faith in the system itself. Do we really think that the public would choose to sign a contract agreeing to have one-third of their earnings stolen to pay for the government’s actions? If not, then it surely cannot be said that the system of involuntary taxation is any type of consensual relationship. And if the relationship is not consensual and voluntary, then it is not legitimate. If tax revenue was put into projects of value to the people they would be more likely to voluntarily contribute money. Although our culture projects a pretty bleak view of human nature, our world is filled with a diverse spectrum of people who are kind and care a great deal about their neighbors. Recent studies have even shown that compassion might be hard-wired into the human genome. While it is true that people are naturally driven by incentives, most people also exercise empathy for their fellow human beings and are driven to help others when possible. In fact, helping others and the emotional reward it provides is often the incentive needed to drive people to help others. In fact, Americans donated more than $358 billion to charities in 2014. This is after the public had already been mugged for one-third of their income by the government. Imagine how much they would have given had they been able to keep all of their income and had the reassurance of knowing their money was actually being spent correctly. Not to mention, imagine if all the money the public gives to wasted political campaigns was redirected to projects that the community actually wanted. There is no need to force compassion and anyone who claims that charity must be forced does not have your best interest at heart. The myth that the public benefits from taxation is just an elaborate advertising scheme that attempts to justify its existence. Even mobster Al Capone ran soup kitchens in Chicago so the people would overlook his crimes and see him as a charitable man. The government takes the same approach by spending some of their pocket change on welfare programs and community projects, but all of this is only done out of an obligation to maintain the appearance of effective management of tax revenue. There could be essential life-saving programs that would always be receiving donations, and available to everyone in the community—whether they donate or not. Since these areas are so vital to life they would likely receive the funding needed due to the high value of the service. For example, water treatment plants, firefighters, or community gardens would have no problem with funding because they are in high demand. Beyond the basic necessities, a myriad of secondary programs and services from transportation, internet, and space exploration could also be funded through voluntary donations from the community. Remember, as a result of the lack of overhead and enforcement costs which inflate all bureaucratic budgets, this would likely be cheap in comparison to the prices that we see today on public projects. Some may be concerned that it would be hard to achieve community goals on a voluntary basis, but this would actually improve the efficiency and value of public services. Oftentimes government-funded jobs don’t even see completion! It is unbelievably common for Western governments to start popular programs during election years to gain public support, only to later pull the plug so the funds can be used for wars or bailouts. This kind of manipulative behavior takes place all the time. However, when there is a project that has enough support, it will usually receive sufficient donations from individuals, businesses and charity organizations to keep the program operating. This can clearly be seen in the explosion of online crowdfunding websites and campaigns. We also saw this in the United States in 2011, when the government pulled the plug on funding for the SETI space program in the midst of a half dozen wars and major austerity measures. This was a program that the public felt so strongly about that over 2,000 donations were received in a single week, easily surpassing their goal of $200,000. When a need arises in a community, people naturally and spontaneously come together to take care of what needs to be done. They don’t need a bureaucrat with a gun in their face forcing them to do it. For our species to have a future we must start thinking about more peaceful ways of doing business. We must stop justifying the use of violence in all circumstances—even “soft-core” violence like government legislation, taxation, and indoctrination.